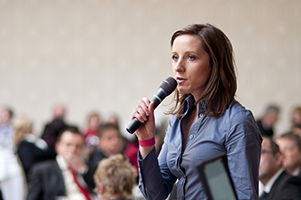 Attending conferences can be highly beneficial as a pharmacy owner or a pharmacist. You arrive at the conference eager to soak in new ideas and ready to network. You also want to return home with the knowledge to implement the concepts that suit your goals, such as increasing your pharmacy’s competitive advantage. So how can you make the most of your conference time? Plan to attend a range of sessions and events that interest you most, but don’t overfill your schedule. If your conference allows it, give yourself the flexibility to be spontaneous and change sessions at the last minute. If you’re going to the conference with a colleague, work together to divide up the schedule of sessions. By dividing and conquering, you will cover more ground for your business. Then, you can share insights at some point during the show or after returning home. Decide the best method for taking notes and tracking information. Be sure to jot down the name of the speaker if you think you may want to contact this person in the future. Take a few minutes at the end of a session to record your final thoughts, any actions you want to take on returning to work, and any resources you wish to access. If you attend a class or session where you really connect with the topic and speaker, be open to asking questions or introducing yourself after the session. Don’t completely skip out on the social events. If you’ve traveled to the conference and you’re attending a full day of sessions, you may be tempted to forego the “meet and greet” gatherings. However, personal contacts are established in these settings, so try to attend at least one or two. Opportunities for collaboration often begin in more relaxed settings. Network when you can. You may strike up a conversation with someone during a session or a break. Ask yourself if this is a fellow professional you could share best practices with periodically. Remember to also use your conference time to meet with contacts you may already know in the pharmaceutical industry. Pharmacy conferences that include an industry trade show with exhibitor booths can be a great way to find products and services to help your company run smarter in a competitive market. Review the list of exhibitors ahead of the conference, and plan which booths you will visit first. Be open to leaving your contact information with the trade show booth representatives if you think they might be able to benefit your business. A show may not be the time to get all of your individualized questions answered, but representatives should be happy to follow up with you in the days after the event. Once you’ve returned home, reach out to those new contacts you made before too much time passes, whether through social media, email or phone. Follow up with those you are interested in doing business with or individuals you want to include in your network. Some of the knowledge gained from the conference should be shared with your team when you return to the workplace. If you learned valuable tips, pass them on to staff members. Make copies of handouts or share website links that might be helpful for colleagues. Let your next conference be your most productive one to date! Real Value RX will be at the PSSNY Mid-Winter Meeting on January 26-28, and the PDS Super-Conference on February 22-24. If you have any questions about our generic pharmaceutical distribution services, contact us today.